← Records Revisited Post 2 of ?? Records Revisited Post 3 of ?? This is part 3 in a series of posts about GNotes, an application I have recently began using to assist with the keeping of records of the bee operation. Taking notes via voice recognition. If you have been texting on your phone for a long time it is possible that you may just want to manually enter your observations. I am not good at thumb typing so I am grateful it is not the only way to make entries with GNotes. As long as I am in an area that has 3G or 4G wireless coverage, notes can be dictated to the phone and they are converted to text. This is perfect for my style of hive inspection. I will admit that voice recognition is not always perfect, but I don’t think this is the fault of the application. Words like propolis are not common and recognition of such speciality words can be poor. Also some words such as “hive” and “five” tend to get confused. It may have something to do with me not speaking clearly enough. As I work with it I am learning to speak in a fashion that is making recognition is increase. The Recorder function along with some other features. If I am in an area that has no wireless data coverage GNotes has a simple voice recorder. It can be used to save the hive inspection as a .3gpp file that is associated with the hive in question and then manually entered later while at the computer. In order to play the .3gpp file you may need to install VLC Player on your computer or just have the phone play the file while you type. Not as nice as voice recognition, but better than my previous method of writing on paper, then transcribing to a word document. Most can type faster while listening than by reading from a messy, handwritten piece of paper. A recent picture of 1107. 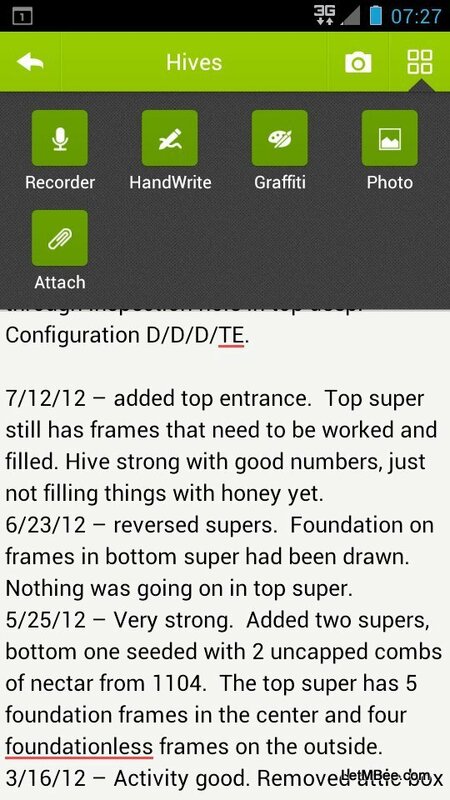 Pictures can be taken within each of the notes so that the hive can be visualized. Having pictures of things along with the records helps to take me back, recalling things about the inspection or observation. 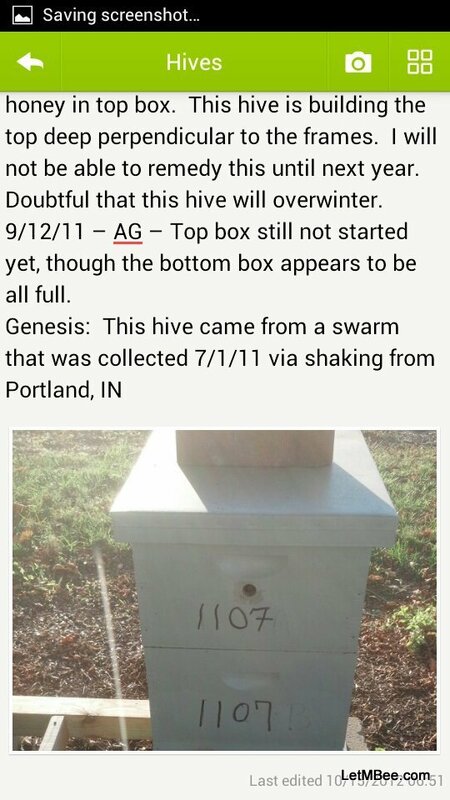 I can remember more by visual cues about a hive than I can by seeing it as 1107 on a piece of paper. This function will be great to have next summer as supers are added to the hives. I will be able to take a picture before departing and have a record of the super-status of each hive. It will make it easier to determine where all of the equipment has gone. This functionality will also be useful during winter to assess hive equipment in need of painting and/or replacement in the spring. Looks like that will be it again for today. In the next instalment I will be showing browser views of GNotes from the computer. Until then any questions or comments? 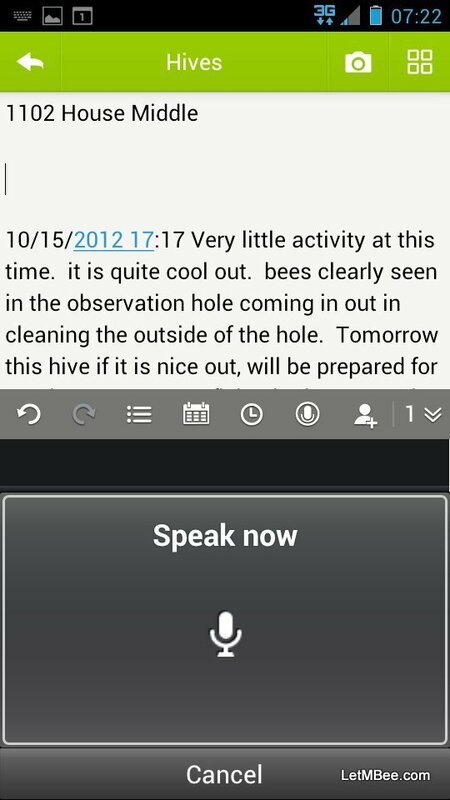 This entry was posted in Hive Reports, HowTo, Posts and tagged bee, Indiana Beekeeping, Jason Bruns. Bookmark the permalink.